I took a look around and it looks like I was able to find these tips in our walkthrough that might help! • Find all of the hidden objects and the 3 question marks in purple to unscramble the object names. • Once you have finished, you will receive the LOCKER COMBINATION. • Return to the hospital locker room. • Zoom in on the locker and use the LOCKER COMBINATION on it (E). • Press the buttons to switch the symbols. Find the symbols that match the words on the combination; they are written on the bulletin board in the same room. 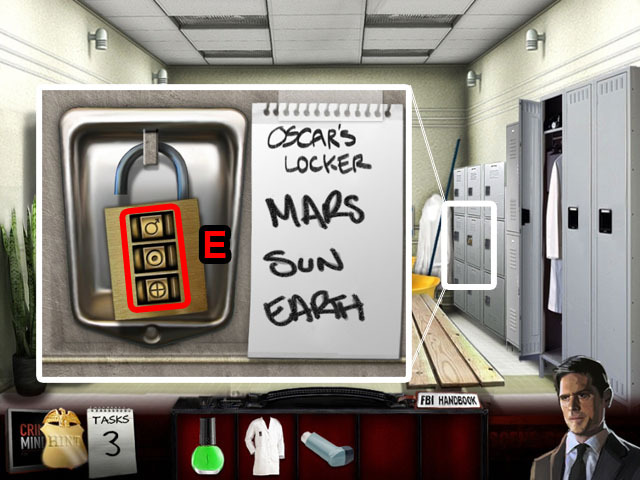 • Opening the locker will start a Hidden Object Scene.